I've been meaning to review the Cold War Kids ever since Mrs. Design Girl suprised me with tickets to their show at The Orpheum (the same spot we caught Mika) this past winter. The band had tremendous energy and stage presence and the distinctive voice of lead singer Nathan Willett was just as amazing live as it is on the album. On Loyalty to Loyalty, the Cold War Kids go a little darker than their first album, Robbers & Cowards , and set a mood that's palpable and gritty, with raw emotion pouring out of every note. In each song, you can feel the strain in Willett's voice, demading your attention as he spins you a story. "Something Is Not Right with Me", the first song realeased off Loyalty, is amazing. It's a high energy diatribe of personal problems and dilemmas. My favorite verse concerns our crooner trying to call his girlfriend with a less than desirable outcome: "I tried to call you collect, you said you would not accept. Your friends are laughing, 'cause nobody uses payphones." I can't recommend Cold War Kids enough, I've seen them in concert twice now (I first saw them at the Bonnaroo Music Festival way back in 2007) and really look forward to them coming around again. Their music has a truly original vibe to it...I can't wait to see how it grows and changes on their third album due out later this year. 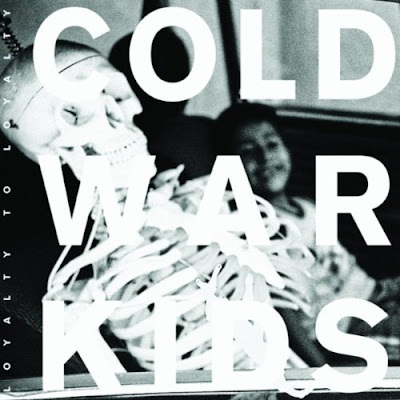 If you're a fan of indie rock on any level whatsoever, Cold War Kids should be in your top ten. A few songs you can't miss are: "Mexican Dogs", "Against Privacy", "Welcome to the Occupation", "Golden Gate Jumpers", and "Avalanche in B", just to name a bunch.